The official OpenBet site boasts that they are the market leaders when it comes to providing online gaming solutions. They certainly provide the platform and the games for some of the biggest names in the industry, especially when it comes to the UK market. 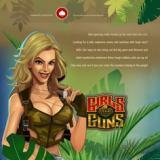 The company has been around since 1996 and their games can now be found on a wide range of popular casino sites. They offer a service that allows gaming site operators to fully tailor the product to suit their goals. OpenBet started out in 1996 under the name of Orbis Technology and just about every year of their existence has seen new clients added to their portfolio. They are now one of the most respected software developers around, with dozens of clients including national lotteries, bookmakers and casinos. Ladbrokes, William Hill, Paddy Power, SkyBet and Betfair are some of the household names who work with them now. The overall collection of games offered by OpenBet in different markets runs to hundreds of titles now, with their casino collection one of the biggest and most varied to be found anywhere. As well as online, their games can also be played on mobile devices. The list of slots games they offer is impressively long, with Merlin’s Millions, Sci Fi Invasion, Supercars and The Cube among the top titles. These are classy games with great graphics and gameplay to keep players coming back for more. Away from the slots action, you will find all of the other casino titles you would expect. This means Blackjack, Caribbean Stud Poker, Baccarat, Roulette, Red Dog, Keno and a lot more. The most popular games are offered in a number of variants and the quality is high throughout their catalogue. The latest games they have released include the slots titles Jungle Bucks, 300 Shields, Monster Cash, Lobster Mania and Pelican Pete. The new release strategy used by OpenBet is to bring out batches of new games on a quarterly basis, usually to coincide with major events such as the World Cup Finals or a Christmas. As well as their own content, they also work with 3rd party content from developers such as IGT and Fremantle. As you would expect from such a major operator in the online gaming industry, customer service is offered around the clock. A number of different languages and currencies are also catered for, although the market in which they are most strongly represented is the UK one. Both the Alderney Gambling Control Commission and the UK Gambling Commission certify the games provided by this software developer. With so many of the most highly respected casino sites using OpenBet you shouldn’t have any fears about trying their games.